Pirouette cookies are easy to make but add so much to all of your desserts. Family and friends will think you spent so much time in the kitchen making these when really you were in and out before the oven was all the way heated! Our favorite way to enjoy these is with homemade ice cream! Preheat oven and cookie sheet to 400 degrees. In a mixing bowl combine butter, sugar, egg whites and vanilla and cream until light and fluffy (6-10 minutes.) Slowly and gently whisk in flour until just combined. Place 1/2 cup of dough at a time in microwave for 8 seconds or until just soft. Drop dollops of dough with a tablespoon spaced far apart onto the heated cookie sheet 4-5 at a time. Tilt the cooking sheet to create large flat circles. Place sheet in oven and bake 4-6 minutes or until edges are browned. 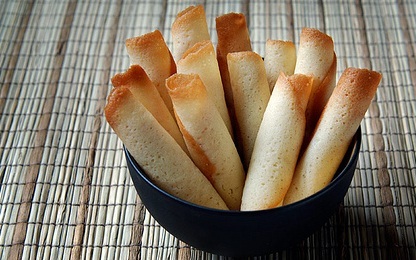 Remove sheet from oven and loosely roll each cookie over and around a wooden spoon. Sit cookies on a cooling rack and allow to cool and fully harden. Enjoy dipped in chocolate or with various desserts! Thank you for visiting and hope you enjoy our future recipes.